The Comedy Club is the Original Comedy Club in Chelmsford, we have been bringing Laughter to Life in Chelmsford since 1996 & have been running five star shows ever since. If you remember seeing Al Murray, Omid Djaili or Russell Howard at the Cramphorn or Michael McIntyre, Lee Mack, Jack Whitehall, Jimmy Carr, Micky Flanagan at The Waterfront alongside 100’s more great comedians, then you have been to one of our shows! Our famously funny nights are now proudly held at Essex’s premier restaurant; the Lion Inn in Boreham, in their state of the art function suite: The Lion House. Thursday Nights out in Essex will never be the same again! Comedians different each show. Food is available on the nights of our shows allowing you to have a great meal in the Lion Inn Restaurant before you walk through the landscaped gardens into the Lion House function suite for the Comedy show. Please try and arrive no later than 7pm if you are planning on having a meal prior to the show. Parties of 10 or more can book with The Lion direct for meal reservations & will need to arrive no later than 6.30pm. When it comes to live Comedy shows accept NO imitations, be careful ! there are a few coming & going in our beautiful City Of Chelmsford! Please note: The Official Comedy Club respects & believes in live comedy for all & DOES NOT run any other shows in Chelmsford. 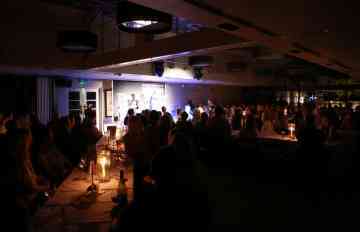 With drink service to your candlelit tables, you can truly relax in the stylish surroundings while enjoying top quality comedy. With FREE parking and the best professional comedians on the circuit gracing The Comedy Club's stage, you know you're in for a fantastic night out! Have Any Questions Regarding The Comedy Club Chelmsford ? The Face Value – this is the price agreed with the promoter or organiser of an event. We work hard with promoters to ensure that this is a fair price. The Booking Fee – this is a charge made to cover the costs of our ticketing service provider, for example the costs of the ticketing software, call centre and our colleagues. The Fulfilment Fee – this is the cost of getting the tickets to you, so includes things like postage costs. Q. What is the age restriction to attend this event? Q. Is there a dress code for this event? Q. What are the timings for the evening? Q. How do I book a table to eat before the show at the Lion Inn Restaurant? Q. How do I purchase tickets for a show at this venue? A. Tickets are sold online through our secure website, please select a date on the right of this page. Q. How do I know which Comedians will be performing on the night? A. 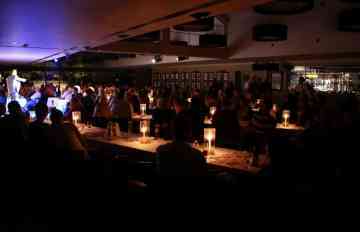 Acts performing will be displayed here on the Chelmsford Comedy Club page. Please choose your show date. Q. My friends and I want to sit all together , but we will be booking separately. Will you be able to seat us together? A. Seating for the show is pre–allocated and reserved for you before arrival. It is advisable that one of your party books all the tickets together in 1 booking, that way your party will be guaranteed to sit together. Q. Do I receive a ticket in the post ? A. When you book online you have the option to pay extra for the tickets to be posted to you but this is not necessary as you can print out your booking confirmation & bring this with you on the night to collect your reserved seating tickets. Hopefully that’s all the info you need to have a really good night! Look forward to letting your hair down and enjoy a great night of laughter, goodness knows we all need it! Polite note: Please respect other audience members & remember, what the comedians say on stage is done in pure fun & jest and they just want to entertain and make you laugh. However, if you are of a very sensitive nature and are easily offended then adult comedy shows may not be your cup of tea. Comedy is a personal choice & what you might find hilarious others do not and vice versa. That’s variety, that’s life!